Everyone who works in the field of education is familiar with the concept of ‘lifelong learning’, the journey of learning and personal development we all make through the sequential stages of our life. Viewed at the scale of a life, for most people, formal education as an environment for learning, occupies only a relatively small part of their lifelong learning activity. The vast majority of their lifespan pre-school and post- school, college and university, is conducted in the domain of informal experiential learning and self- or life-determined personal development. How do we enable learners to prepare themselves for a lifetime of learning to deal with what is an increasingly complex, turbulent and often disruptive world? This is quite a different challenge to the one that Governments like us to focus on namely – how do we prepare learners to be employable or economically productive. It is ironic that one of the simplest and most effective things education can do to prepare learners for learning in the rest of their lives, is to pay greater attention to the informal dimension of their learning lives while they are involved in formal study. Adopting such a holistic perspective on experience, learning and achievement has the additional benefit of encouraging learners to make use of their imagination and creativity, as well as their critical thinking, across the whole of their life. What is Lifewide Learning & Education? Nearly 100 years ago the adult educator Eduard Lindeman argued that, ‘the whole of life is learning therefore education can have no ending’. By raising students’ awareness of the significance of the whole of their life as the essential resource to sustain their own learning and development, by equipping them with the cognitive tools and methods to help them navigate and learn from their own life experiences, andby valuing and recognising learning and achievement gained through experiences in all aspects of their life, educational institutionscan enhance individuals’ preparedness for learning through the rest of their life. The concept of lifewide learning (1) helps give meaning to lifelong learning by recognising that most people, no matter what their age or circumstances, simultaneously inhabit a number of different spaces – like work or education, being a member of a family and or caring for others, being involved in a club or society, travelling and taking holidays and looking after their own wellbeing mentally, physically and spiritually. We live out our lives in these different parallel spaces so the timeframes of our lifelong journey and the multiple spaces and timeframes of day to day existence across our lives, intermingle, integrate and accumulate. Who we are and who we are becoming are the consequences of this intermingling and it’s our lifewide experiences that we weave together to create the multiple narratives that is our life. Lifewide learning includes all types of learning and personal development in formal educational environments that is directed or self managed, together with learning and development in informal settings that is motivated by our own interests and needs, and learning that just emerges during the course of our daily life. Lifewide education (1) embraces, encourages and supports lifewide learning. It can be developed and implemented at all levels of an education system and is supported by professional learning and development initiatives like imaginEd and Lifewide Education. First and foremost it recognizes that ‘the whole of a learner’s life is learning therefore education can have no ending’: the learner’s curriculum is therefore unique to them and comprises, in addition to what is prescribed by the educational institution, all their experiences beyond the classroom. In higher education this can be represented by the idea of a lifewide curriculum (2). Gillian Judson (Director of imaginED) is developing the idea of a Walking Curriculum (3). 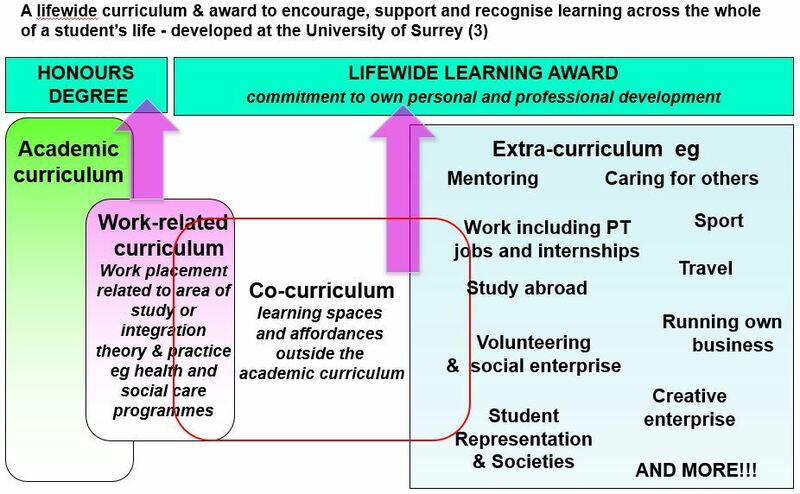 Such a curriculum supports the idea of lifewide learning and education and could be implemented in any of the curricular domains shown in the lifewide curriculum diagram. There is much talk about re-creating educational systems that are more effective for the future needs of society but there is little evidence that educational policy making is being informed by these ideas. 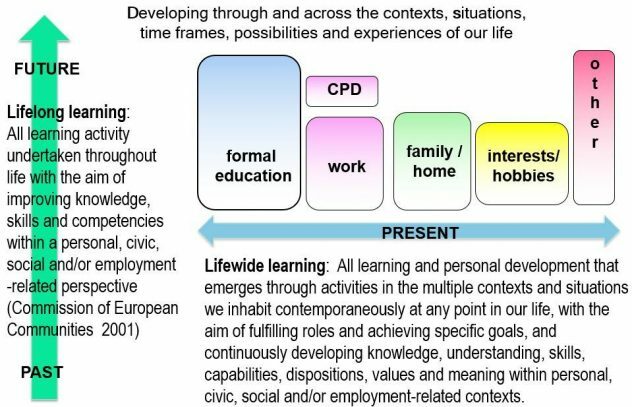 However, one small cause for optimism was the publication in 2011 of an influential European Future of Learning Foresight Study (4) which incorporated the concept of lifewide learning into its central learning paradigm. ‘The overall vision [of learning] is that personalisation, collaboration and informal learning will be at the core of learning in the future….The central learning paradigm is thus characterised by lifelong and lifewide learning and shaped by the ubiquity of Information and Communication Technologies (ICT)’. Lifewide learning and education hold the promise for a more complete and holistic form of education in which people combine and integrate their learning (both formal and informal), their personal or professional development and their achievements. For teachers and educational institutions the key question is, how are you helping and enabling your learners to develop themselves for a world 30, 40 or 50 years from now that they and we cannot begin to imagine? In what ways are you enabling them to see and draw upon the whole of their life as a resource for learning? And how are you equipping them with the tools that will enable them to sustain themselves as they encounter and navigate the complexities of a mainly informal world of learning. Finally, how does the philosophy and practices of imaginEd relate to the idea of Lifewide learning and education? There is a synergy between these ideas and practices that should be explored. Jackson, N.J. (2011) An imaginative life wide curriculum, in Jackson, N. J. (Ed.) Learning for a complex world: A lifewide concept of learning, education and personal development. Authorhouse (pp. 100-121). Judson, G. (2018) A Walking Curriculum: Evoking Wonder And Developing Sense of Place (K-12): KDP.